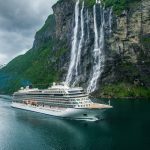 Viking Cruises® today announced that its third ship, Viking Sky®, was officially christened during a public celebration in Tromsø, Norway. Located above the Arctic Circle on Norway’s northwest coast, Tromsø is a popular destination for viewing the northern lights – and a key port of call on Viking’s popular Into the Midnight Sun itinerary, which sails between Bergen and London. The 930-guest, 47,800-tonneViking Sky navigated into the Tromsø harbour this morning, where she received a warm welcome with coordinated water cannons from Norwegian redningsskøyten boats, music from local bands and flag-waving Tromsø residents. After arriving today in Tromsø, Viking Sky was positioned in the harbour adjacent to a concert stage constructed specifically for the celebration, with performances from a variety of Norwegian musicians – including Arctic Philharmonic, Lisa Stokke, Violet Road, Sara Marielle Gaup Beaska and Jørn Hoel. Marit Barstad, sister of Viking Chairman Torstein Hagen, served as ceremonial godmother and offered a blessing of good fortune and safe sailing for Viking Sky – a naval tradition that dates back thousands of years. Several elements of the christening ceremony paid homage to the Norwegian heritage of both the company and godmother. Instead of champagne for the traditional bottle-breaking, Viking Sky was christened with a bottle of Gammel Opland aquavit. Additionally, in honour of the original Viking explorers, a gilded Viking axe was used to cut the cord for the aquavit christening. This particular axe used is a replica of a gilded Viking axe artifact discovered near Tromsø. Immediately following the christening, Viking Sky set sail from Tromsø with a convoy of small boats and fishing vessels to spend the longest day of the year in Nordkapp (North Cape). 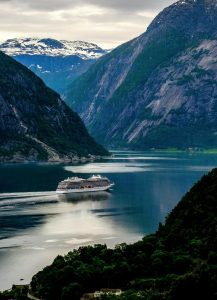 The ship will now spend the summer season sailing Viking’s popular itineraries in Scandinavia and the Baltic, before crossing the Atlantic in September on her way to the Americas and the Caribbean. Follow in Viking Sky’s path and embark on a 13-day cruise with Viking Cruises’ new In Search of the Northern Lights itinerary. Priced at $7,995 per person, with departures from London in March 2019 on board Viking Sky, Viking is currently offering a $1,000 air credit per person when booking this itinerary before 30th September 2017, conditions apply. For more information or to book, please visit www.vikingcruises.com.au/oceans or call 138 747.